When in 1990 the solar probe Ulysses embarked on its 19-year-long exploration tour, the participating researchers turned their attention not only to our Sun, but also to significantly smaller research objects: interstellar dust particles advancing from the depth of space into our solar system. 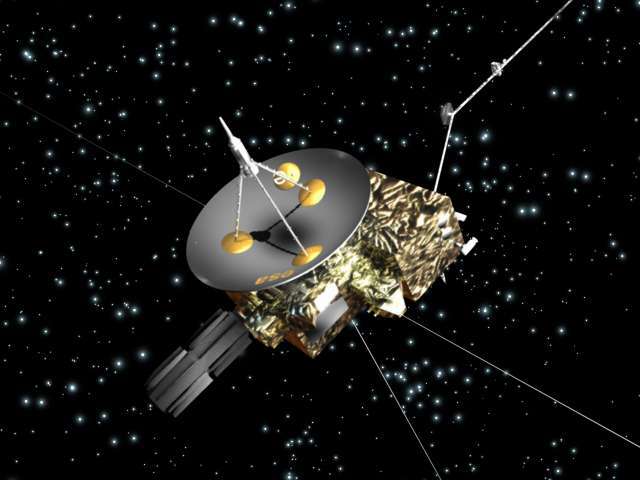 Ulysses was the first mission with the goal to measure these tiny visitors and successfully detected more than 900 of them. Researchers under the leadership of the Max Planck Institute for Solar System Research (MPS) in Germany and the International Space Science Institute (ISSI) in Switzerland present a comprehensive analysis of this largest data set of interstellar particles in three articles published today in the magazine The Astrophysical Journal. Their conclusion: Within the solar system velocity and flight direction of the dust particles can change more strongly than previously thought. Perpetually our solar system moves through the Milky Way. For approximately 100 000 years it has been passing through the Local Interstellar Cloud, a cloud of interstellar matter, measuring about 30 light-years in diameter. Microscopic dust particles from this cloud make their way into the interior of our solar system. For researchers, they are messengers from the depths of space and provide basic information about our more distant cosmic home. In the past, several spacecraft have identified and characterized these "newcomers". These spacecraft include Galileo and Cassini, which traveled to the gas planets Jupiter and Saturn, as well as the mission Stardust, which in 2006 returned captured interstellar dust particles to Earth. "Nevertheless, the data from Ulysses, that we have now evaluated the first time in their entirety, are unique," explains Harald Krüger from the MPS, Principal Investigator of the Ulysses dust detector. For 16 years the instrument examined the stream of particles from outside our solar system almost without interruption. Compared to this, other missions provided only snapshots. "In addition, Ulysses' observational position was optimal," says Veerle Sterken from the ISSI, who led the analysis together with Harald Krüger. Ulysses is the only spacecraft so far that has left the orbital plane of the planets and has flown over the Sun's poles. While interplanetary dust produced within our planetary system is concentrated in the orbital plane, interstellar dust can be measured well outside this plane. "Under the influence of the Sun and the interplanetary magnetic field, the dust particles change their trajectories," explains Peter Strub from MPS. Depending on the mass of the particles, the gravitational pull and the radiation pressure of the Sun as well as the interplanetary magnetic field within the solar system change their flight direction and speed. "Since the Sun and particularly the interplanetary magnetic field are subject to an approximately twelve-year cycle, only long-term measurements can truly unravel this influence", the researcher adds. From the data of the more than 900 particles, the researchers could extract the most detailed information on mass, size, and flight direction of interstellar dust so far. Computer simulations helped to understand the various contributions of the Sun and the interplanetary field and to separate them. The study confirms earlier analyzes, according to which the interstellar dust always traverses the solar system in approximately the same direction. It corresponds to the direction in which the solar system and the Local Interstellar Cloud move relatively to each other. "Minor deviations from this main direction depend on the mass of the particles and the influence of the Sun," says Strub. In 2005, however, a different picture emerged: The far-traveled particles reached the dust detector from a shifted direction. "Our simulations suggest that this effect is likely due to the variations of the solar and interplanetary magnetic field," says Veerle Sterken from ISSI who performed the simulations and led the interpretation of the data. "Altered intial conditions within the Local Interstellar Cloud are likely not the reason." The researchers also took a close look at the size and properties of the particles. While the majority of the dust particles has a diameter of between a half and 0.05 micrometers, there are also some remarkably large specimens of several micrometers size. "Efforts to characterize the dust outside our solar system with the help of ground-based observations from Earth have not revealed such large sizes", says Krüger. In return, the very small particles, which astronomers typically find with telescopes, cannot be found in Ulysses measurements. As computer simulations show, compared to their mass these tiny particles become strongly electrically charged within the solar system, are deflected and thus filtered out of the main interstellar dust stream. The simulations also indicate that the exotic dust has a low density and is therefore porous. "Ulysses' dust detector cannot measure the particles' inner structure directly", says Sterken. "However, on the computer we can try out different densities. With porous particles the observational data can be reconstructed best", the Belgian scientist adds. The composition of the interstellar particles cannot be determined with the dust instrument onboard Ulysses. However, this is possible with the successor instrument on the Cassini spacecraft developed at the Max Planck Institute for Nuclear Physics in Heidelberg. Its measurements will allow for completely new insights into the origin and evolution of interstellar particles. Measurements with dust detectors thus provide a look into the Local Interstellar Cloud, which can only be studied by observations from Earth otherwise. In the future, dust researchers want to propose space missions to the European Space Agency to investigate interstellar dust. The Ulysses space mission was a joint project of ESA and NASA. The Ulysses dust detector was built and operated at the Max Planck Institute for Nuclear Physics in Heidelberg, with the participation of the German Center for Aerospace. The German Research Foundation and the International Space Science Institute in Switzerland made the evaluation of the long-term measurements of interstellar dust possible. What will Voyager 1 discover at the bow of the solar system?